Each pair of shaped pads are made specifically for ReactorPanel saddles. They will often fit other flex-panel endurance saddles, too! The unique construction allows the pad to move and flex with the panels. The top of each pad is durable cordura. The bottom is 100% WOOL fleece. We stock BLACK. However, if you would care for another color, we would be glad to fulfill your special order. 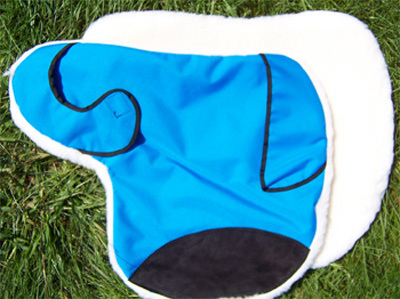 In addition, these special pads are available in either length, with a 4" cantle extension. The cantle extension is an additional section of pad that will cushion your horse's back from irritation caused by cantle bags or gear tied to the rear of the saddle. CLOSEOUT NOTICE: We have a limited supply of this item with WOOL/POLY fleece bottom.